Hello, My name is Shaunae Smith! :) I'm from Dorchester ,MA. I graduated from Tech Boston Academy, and in the fall I will be attending Johnson & Wales. 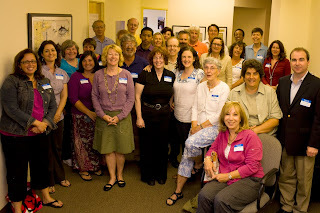 I am very excited to be a part of my new found family at Save the Harbor/Save the Bay. Before about 2 weeks ago I knew nothing about Save the Harbor - I didn't even knew such a program existed. I found out about the program the Island Ambassadors. Although I didn't know much about Save the Harbor/Save the Bay, I now know one thing: this program is giving me the opportunity of a lifetime. It is allowing me to do something that I am passionate about. 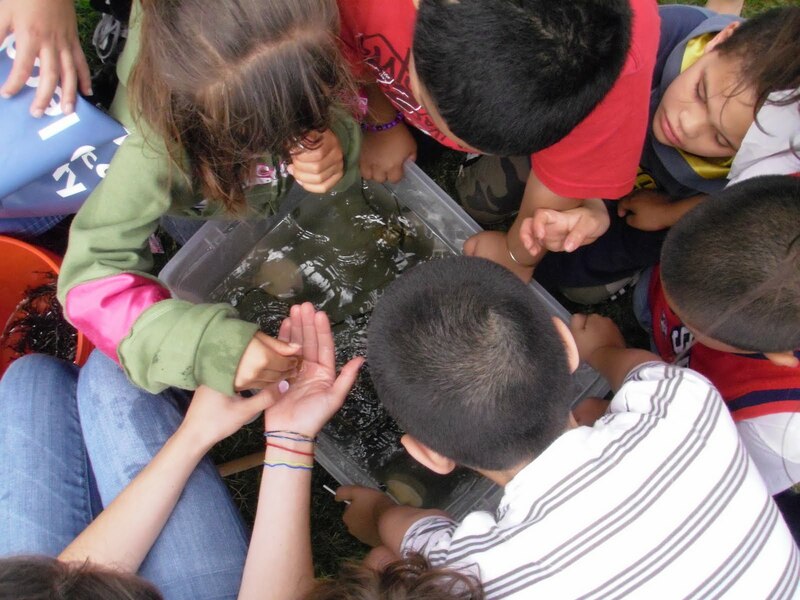 Save the Harbor/Save the Bay is also allowing me to work with children and teach them and teach myself, and also be outside exploring....it doesn't get any better than that! So I applied and here I am. So far things have been great, and hopefully this summer doesn't end my time with Save the Harbor/Save the Bay. I'm super excited that I have started my new job...I must admit it doesn't even seem like a job. It seems more like a chance of a lifetime. Over these past couple of days I have done and seen things that I have never done before. For the first time in my entire life I rode in a boat. It was one of the most fun things ever. Also, for the first time I have had the chance to see one of the most beautiful things - I got the chance to see 2 of the many islands in Boston Harbor. I have to say the the climbs were rough but the views were great. When I got to the top of Spectacle Island I saw a view of Boston that I have never seen before. It made my view of Boston a lot different , and it also made me realize that things can be so beautiful when looking from a different angle. I must say I have the best job and boy oh boy do I love it. Summer began "officially" last week, but for me it began today with the first meeting of our 2010 summer youth environmental education staff at our offices at the Fish Pier on Boston Harbor. 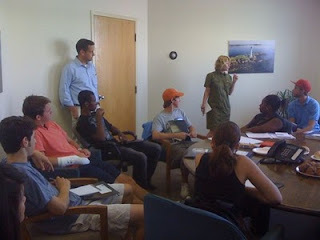 Our President Patty Foley welcomed everyone to the Save the Harbor team, and then we got right to work. First stop - Long Wharf, for a visit to Spectacle and Georges Island with SH/SB's Maritime Historian and songster extraordinaire David Coffin - who has promised us a post about the island visit soon. Today we are meeting at 9:00 - to familiarize ourselves with the equipment we are going to be using this summer, and plan to visit most of our Boston Harbor Explorer sites as a group this afternoon. You're invited to our 2nd annual folk festival, featuring 13 acts. Musicians playing music from Italy, Greece, Cambodia, Haiti, Russia, Span. America. Brazilian capoiera, and Japanese calligraphy, story-telling, dancing lessons. This Saturday, July 3 from 2-7 PM at Heritage State Park, off the Lynnway. 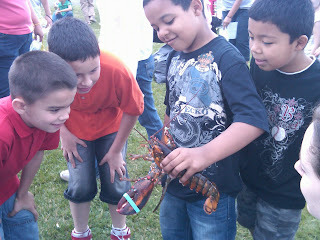 East Boston YMCA packed Constitution Beach on Bunker Hill Day for a fun-filled Summer Kick-off celebration. The event featured free lunch, games, information tables and plenty of splashing around on the water's edge. Jen from Save the Harbor brought along a touch tank that was a big hit with all the kids - especially the lobster, razor clam and other critters. 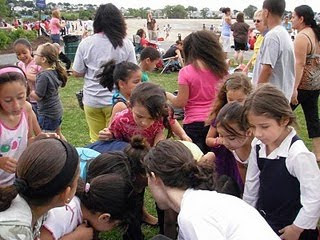 The event gave over 400 kids from East Boston and their parents a great way to spend the day off from school and an opportunity to connect with the East Boston YMCA and their summer free lunch program. We look forward to more great family events at Constitution Beach later in the summer, including a movie night and campfire - all thanks to the folks at East Boston YMCA. Check back here for more on events throughout the summer! Hi everyone! My name is Jennifer Last and I am the Youth Program Coordinator/Lead Teacher at Save the Harbor/Save the Bay this summer. Today I attended the summer kick off event at Constitution Beach. It was great to see all the activity at the waterfront, and so many people of all ages having fun on Boston Harbor. We had a touch tank filled with critters we gathered from the waters edge. All I had to do was scan the intertidal zone (between high and low tide) and the shore, and we found hermit crabs, green crabs, razor clams, mussels, clams and much more. You can find lots of interesting sea creatures and observe them right at the water front or in a bucket. Be sure to put them back when you are finished, unless you are going to eat them, or use them for bait! 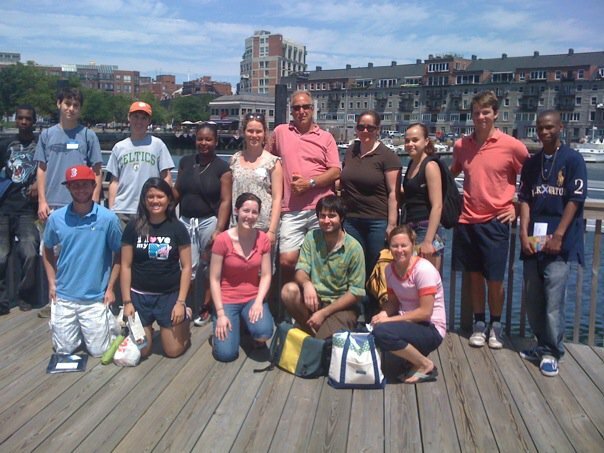 Save the Harbor / Save the Bay's Boston Harbor Explorers program will be at Piers Park in East Boston every day this summer - and on Constitution Beach as well. Hope to see you at the beach or on the shore! Thanks East Boston YMCA for hosting the annual summer kick off day at Constitution Beach. It was great! Hi everyone! My name is Caitlin and I’m the new programs and events intern for Save the Harbor/Save the Bay. I want to tell you about All Access Boston Harbor, a fun and FREE opportunity for youth organizations to spend a day on the water at one of the Boston Harbor Islands. On every Tuesday, Wednesday, and Thursday from July 6 through August 19, Save the Harbor/Save the Bay will be sponsoring day trips to both Georges and Spectacle Islands. In the past years the kids have had an amazing time! If you’re interested in touring the historic Fort Warren, exploring underground tunnels, or catching fish, Georges Island is the place for you to go this summer! If kite flying, miles of hiking trails, and lounging on sandy beaches is more your style, you should sign up to come with us on a trip to Spectacle Island! Reservations for the trips are required and space is available on a first come first serve basis, so don’t wait! For the third year running Save the Harbor/Save the Bay has given valuable assets to fund events around the Boston beaches area. At a press conference on the Boston Fish Pier on Saturday, June 12th, the non-profit organization Save the Harbor / Save the Bay awarded $30,500 in grants to 11 groups to support 35 free public events in nine Boston Harbor region beachfront communities from Nahant to Nantasket. 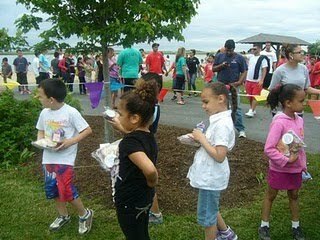 In addition, Save the Harbor announced that in the fall they will introduce the “Best of the Beaches” awards of up to $2,000 to organizations that deliver outstanding events on our region’s public beaches in Lynn, Nahant, Revere, Winthrop, East Boston, South Boston, Dorchester, Quincy and Hull this summer. This year’s "Better Beaches" events will include beachfront concert series, kite festivals, sand sculpting competitions, beachside art shows, environmental education programs, family fun nights and reading programs, volleyball tournaments and several beach festivals. The program is made possible by a $25,000 grant from the Boston Foundation, $25,000 of in-kind support from the Department of Conservation and Recreation (DCR), and the financial support of Save the Harbor’s corporate partners at National Grid, Comcast Massachusetts, and JetBlue Airways. "I love our beaches. 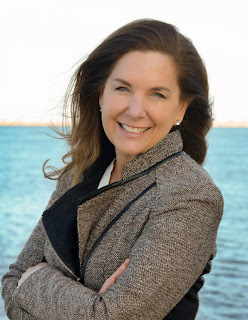 I love all these groups and Save the Harbor/Save the Bay for making them work even better," said State Representative Kathi-Anne Reinstein who co-chairs Metropolitan Beaches Commission. In addition to the grants, local Friends groups will raise an additional $160,000 in direct and in-kind support for their events and capacity-building initiatives, resulting in a total investment of more than $190,000 in free events and activities on the region’s public beaches. With the Better Beaches program in its third year, Save the Harbor called on local beach groups to submit proposals that strengthen their organizations and allow them to sustain beach programming in the longer term. Groups responded with creative revenue-generating ideas for merchandising kites, T-shirts, totes, and hats as well as developing corporate partnerships, membership drives, raffles, fundraising events, marketing and media strategies. Save the Harbor / Save the Bay introduced the Better Beaches Small Grants Program in 2008 in response to a key finding of Metropolitan Beaches Commission’s report which called for increased programming on the area beaches. In the program’s first two years Save the Harbor / Save the Bay funded events designed to jumpstart public activities and programming on public beaches. Through 2009, the program leveraged a total of over $180,000 investment in free events and programs on the region's public beach. Be sure to frequent these events and get the most out of the Boston beaches this summer! Good News From the Beach! At 10:00 A.M. on Saturday, June 12th, at our office on Boston’s Fish Pier, Save the Harbor / Save the Bay will award $30,500 in "Better Beaches" grants to 11 groups to support 35 free public events in nine beachfront communities from Nahant to Nantasket. This year’s events include beachfront concert series, kite festivals, sand sculpting competitions, beachside art shows, environmental education programs, family fun nights and beach based reading programs, as well as volleyball tournaments and beach festivals. In addition, Save the Harbor will announce a new initiative, the “Best of the Beaches” awards, with cash prizes of up to $2,000 to be awarded later this year to organizations that deliver outstanding events on our region’s public beaches in Lynn, Nahant, Revere, Winthrop, East Boston, South Boston, Dorchester, Quincy and Hull this summer. Save the Harbor / Save the Bay's "Better Beaches" program grew out of the recommendations made by the Metropolitan Beaches Commission in their 2007 report “Beaches We Can Be Proud Of.” It is made possible by a generous grant from the Boston Foundation, in-kind support from the Department of Conservation and Recreation (DCR), and the support of Save the Harbor’s corporate partners at National Grid, Comcast, and Jet Blue Airways. This year local beaches friends groups will invest an additional $160,000 in direct and in-kind support for their events themselves, resulting in a total investment of more than $190,000 in free events and activities on the region’s public beaches in 2010! We expect Metropolitan Beaches Commission Co-Chairs Senator Jack Hart and Representative Kathi-Anne Reinstein to attend, as well as other commissioners, elected officials and representatives of our foundation, corporate and beach community partners. For more information about the "Better Beaches" program or Saturday's announcement, contact Save the Harbor / Save the Bay’s Director of Strategy and Communications Bruce Berman directly on his cell at 617-293-6243.